Isn’t there something particularly satisfying about build something with your own hands? While spring is still several weeks away, watching this project made has me really looking forward to replanting my garden. The best part of the below project is you don’t really need much prior experience in gardening at all to succeed with it. Just follow the simple instructions, and it will go splendidly. I know it would certainly look great in my home. To start, you need a wooden box, like the one pictured above. Start by drilling about 5 cm large holes. The distance between the holes should be approximately 15 cm. Next: it’s time to start planting the petunia flowers! Start by planting the first row of flowers, then cover them with soil. Use packing foam as a filler in the rear of the planting box. Plant flowers along the next line and repeat the above steps to fill the rest of the holes in the box. Here are the flowers on April 13 – planted and ready to bloom into a beautiful garden! Note: The holes in the box can make the soil dries up easily, so make sure to water every day. A little organic fertilizer once a week will also help. And indeed, by August 24 – the flowers were back! 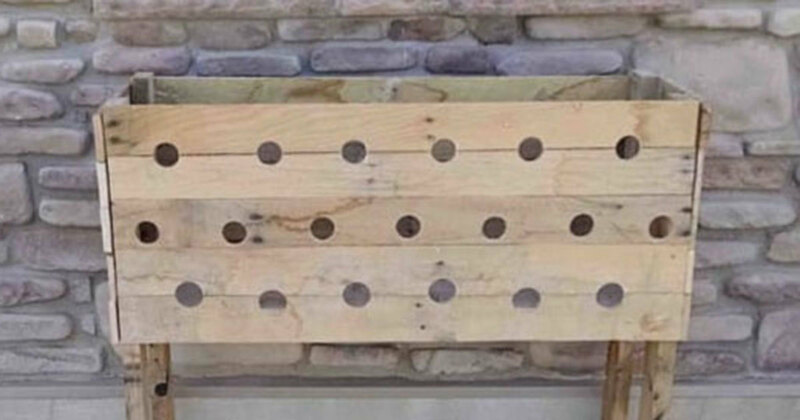 Who would have guessed that this flower box with holes could offer something so alluring? I will anyway try this at home! Please share this DIY project further with everyone you know so that more people have the chance to discover this clever trick!